The smell of Coppertone “lotion,” we used to call it, (currently, “sunscreen”) has the power to transport me to all the beaches I’ve loved, all at once. Science tells us that smell is the strongest memory trigger. It’s also true that we remember things longer and more vividly when emotion is included in the experience. Child birth, where you were when President Kennedy or John Lennon were shot, the beach you spent your summers at with friends — if you experienced any or all of those, you likely have a memory marker for them complete with details. 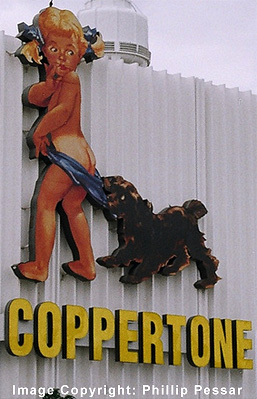 Coppertone sunscreen also brings to mind the earliest of their billboard and print ads. You can see what I’m talking about in the picture to your right. No scent involved, so why so memorable? Consistency of message and image across many platforms. That one image ran on billboards, in newspapers and magazines; they even paid small planes to fly over the beach trailing a banner with it. Granted, the world of marketing was less crowded, and Coppertone had lots of marketing dollars. What we have that they didn’t are free as well as paid ways to get our message and our products and services. So what’s the most important marketing tip I have? Get out there consistently and with consistency of message. “But Greg, how do I know where to be or what to put out there?” you ask? “What if I’m already out there on lots of platforms but not getting the results I want — leads that convert to paying customers?” some of you might ask. Clearly there isn’t one answer for each of you reading this, as you’ll all be in different places in your business, but let me take a stab. Pick a place that your people can be found and play, participate, get curious about who these people are, what their real needs and pains are. Is it consistent across all platforms and marketing media you are using? Are you saying it the same way every time and saying it often? Neil Patel has a short video on “why you should repeat your message over and over again.” (Scroll down that page, it’s on the right side; can’t link to it.) So it sinks in, so you become known and trusted as an expert or advisor, so more people buy because they “get” who you are and what you do. We are creative with so many ways of expressing ourselves — that’s great and keeps things interesting for us. But for those people we’d like to work with or include in our communities, if the many creative things we do don’t have the same or similar message, people won’t know who it’s from. Worse, they won’t know what you stand for. When I was a chef in NYC of a 185-seat midtown restaurant, we changed the menu only 3 times per year — seasonally. My first couple of years I would look forward to the change so I could take things off that we, (the cooks and I,) were tired of making. We wanted to do new stuff! Every time, I got shot down on the apple tarte tartin and the crab cakes. Apple tart in July? Well, that’s just wrong. Crab cakes are fine, but they said summertime to me, not January. You can probably guess why we had to keep them on the menu. They were popular and we were known for these items. Those are just two items out of about 15 other things on the menu that we were known for, so on the menu they stayed. How I solved my boredom was by doing daily specials using seasonal ingredients and plenty of out-of-the-box creativity. One other point from this story: Daily we did specials, different ones every day. We consistently delivered another thing we got known for. The two marketing messages hidden in here are: we consistently delivered the same high-quality dishes until we got known for them and then, consistent with our style of food and quality, we teased people away from the same old favorites with something different. I want to add another tip to the most important tip I’ve got. Do something small every day if you aren’t consistently putting yourself out there yet. If you are and need different results, run your message by some close friends who don’t know your business well. Ask them what they think you do. Is it what you do? For both groups, take a look at what you are offering. You can have a whole menu of items, but you want to focus on your core thing; the thing you are driven by, the thing without which you would not be in business. You don’t need Coppertone dollars to become memorable but you do need to be clear and consistent. It might seem boring at first, but a steady stream of fans, clients, or buyers might just give you more time on the beach.